Four novel polyhedral oligomeric silsesquioxanes/polystyrene (POSS/PS) nanocomposites, having formula R7R′1(SiO1.5)8/PS (where R = C6H5– and R′ = p-C6H4-X, with X = –CH3, –OCH3, –F, –Cl) were synthesized by in situ polymerization of styrene, in the presence of 5% w/w of POSS. The obtained nanocomposites were characterized by 1H-NMR spectroscopy and by the glass transition temperature (Tg) determination. The thermal degradations of nanocomposites were thus carried out in thermobalance, in the scanning mode, in the temperature range r.t.—700 °C, in both flowing nitrogen and static air atmospheres. Temperature at 5% mass loss (T5%) was determined as parameter measuring the resistance to thermal degradation. 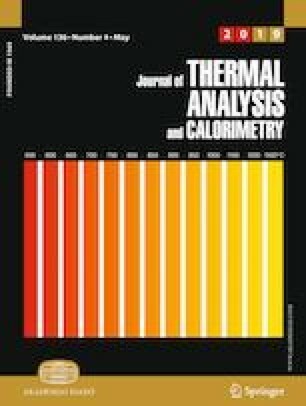 The obtained T5% values of nanocomposites were largely higher than those found for PS, which was also degraded for comparison in the same experimental conditions, thus indicating higher resistance to thermal degradation in respect to neat polymer. Also, the sameness of nanocomposites T5% values was interpreted and explained. Ignazio Blanco is grateful to the MIUR for the grant “Fund for basic research activities,” and to the University of Catania within the “Piano della Ricerca Dipartimentale 2016-2018” of the Department of Civil Engineering and Architecture, for supporting the project MATErials LIfe foreCAst (MATELICA).